To view the Complete Streets Request Form for dedicated bus lanes along Whalley Avenue, click here. Whalley Avenue, which connects Downtown New Haven to the Town of Woodbridge through six city neighborhoods, is one of the most important thoroughfares in the City. Handling as many as 30,000 cars a day in some sections, the Avenue is heavily traveled by commuters in cars and CT Transit’s B-bus line. Whalley is also a major commercial street with numerous walk-in and drive-through businesses lining its entire length. 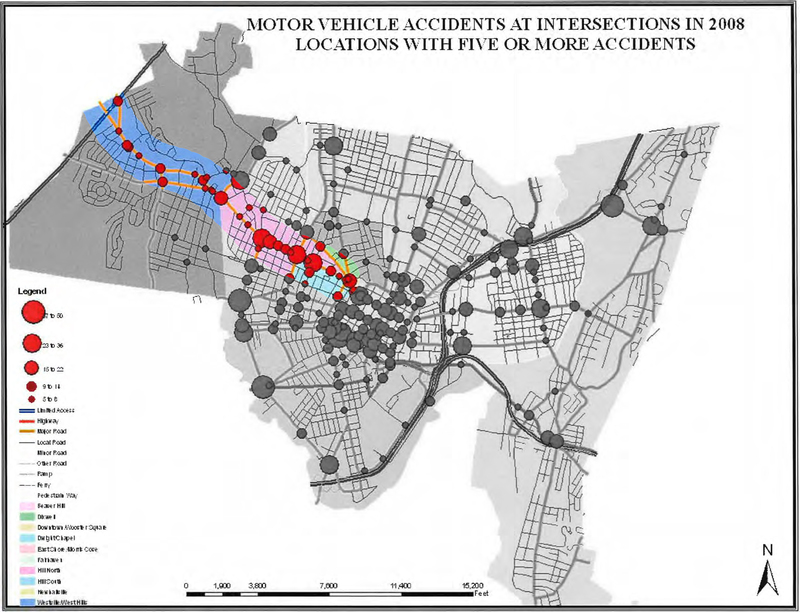 As a heavily traveled street lined with commercial and residential land-uses, Whalley Avenue also has one of the highest concentrations of vehicle accidents in the City – representing one of many problems facing the major thoroughfare. Whalley Avenue was first laid out in 1797 to connect Broadway and Downtown with the Litchfield Turnpike. Much of the Avenue went undeveloped until the late-19th century when the horse-drawn streetcar made residential development possible beyond the City core. The thoroughfare first developed with villas, but was quickly followed by two-family houses and commercial establishments spreading westward toward Westville. The 20th century brought with it increased commercial development on the lower segment of Whalley Avenue from the Boulevard to Howe Street. The ground floor of houses were converted to storefronts and rows of homes were demolished for multistory walk-up residential and commercial block buildings, some of which were later demolished to make way for automotive-related businesses at mid-century. As a result, the lower portion of Whalley that passes between the Dwight and Dixwell neighborhoods is commercially intensive with wide sidewalks, parking lots, and a mix of commercial building types. The roadway itself spans four lanes wide – two lanes in each direction – with parking on either side of the street. The middle segment of Whalley between the Boulevard and West Park that abuts the Beaver Hills and Edgewood neighborhoods retains much of its late-19th century residential character with fewer commercial establishments than the lower section. Two-family houses with deep porches are prevalent in this section of the Avenue, but apartment buildings and smaller retail businesses can also be found. The roadway widens slightly west of the Boulevard and a central turning lane appears, disappearing again once you arrive in Westville. Prior to the construction of the Whalley Avenue bridge over the West River, which occurred soon after the Litchfield Turnpike was chartered, Westville was accessed from New Haven by way of Goffee and Blake Streets. When Whalley Avenue did finally become the primary route to Westville in the early 19th century, the portion of the street that winds through the Village was referred to as Main Street until 1897 when the Town of Westville was consolidated with the City of New Haven. Having just a single lane traveling in each direction, this segment of Whalley Avenue is the narrowest stretch of the thoroughfare. Past the Village, Whalley widens again to 48-feet to accommodate two travel lanes in either direction with some on-street parking spots along certain stretches. Originally passing fields and farms on the way to Woodbridge along the Litchfield Turnpike, this segment of Whalley now travels through the Amity section of Westville, which development with small commercial strip malls during the 20th century. Sidewalks here are narrow, not shaded, and exposed to speeding traffic, while the pattern of development often requires cars to stall traffic with left turns. Whalley Avenue’s wide width provides an opportunity to substantially redesign the thoroughfare in order to better accommodate bus riders, cyclists, and pedestrians. The following proposes one strategy for doing so, which calls for dedicated bus and bike lanes along the entire stretch of the avenue. While the segment of Whalley Avenue east of the Boulevard does not typically have a central turning lane, the roadway is wide enough (64-feet) to accommodate one in addition to maintaining two lanes running in each direction. Parking lanes would have to be reduced from 8-feet to 7, and the travel lanes would have to reduce from 12 to 10-feet. Moreover, two of the travel lanes closest to the sidewalk could then be converted to bus- and bike-only lanes. Already having sufficient width and lane layout, the middle section of Whalley is primed to accommodate slightly wider bus- and bike-only lanes. With this layout, bikes are able to pass buses that have pulled over into the parking lane to pick-up and drop-off passengers, while buses are able to pull out without having to wait for traffic to let them in. Furthermore, left hand turning cars do not impede the flow of traffic, nor do cars that briefly use the bus lanes to park or make right hand turns. The possibility for having a raised central median with plantings also exists here with turning lanes appearing only at intersections. In the Village, the cycling infrastructure could split between Whalley Avenue and Fountain Street. The advantage of doing so is that a one-way protected bike lane separated from traffic can be created westbound on Whalley Avenue and eastbound on Fountain Street. With this configuration, eastbound cyclists on Whalley would switch over to Fountain Street via Emerson Street, then rejoin Whalley at West Park Avenue. Once past the Village, the roadway would take on a familiar form – two travel lanes in either direction and a central turning lane. Due to width restrictions, however, buses would not regain dedicated lanes, but would continue to travel along with other traffic. Also absent are on-street parking lanes, but bikes would receive their own dedicated 7.5 ft lanes. As one of the most traveled streets in New Haven, Whalley Avenue acts as a showcase of sorts for our priorities as a city. Currently, Whalley Avenue is one of the most accident-ridden corridors in New Haven. Moreover, the street can often be a daunting experience for 1) cyclists leading to sidewalk riding or total avoidance; 2) pedestrians who often must cross wide streets, curb cuts, parking lots, and stretches without shade trees; and 3) bus riders that get stuck in traffic, find service unreliable, and miss buses. Surprisingly, however, Whalley Avenue’s carrying capacity exceeds demand on virtually every stretch of the road. 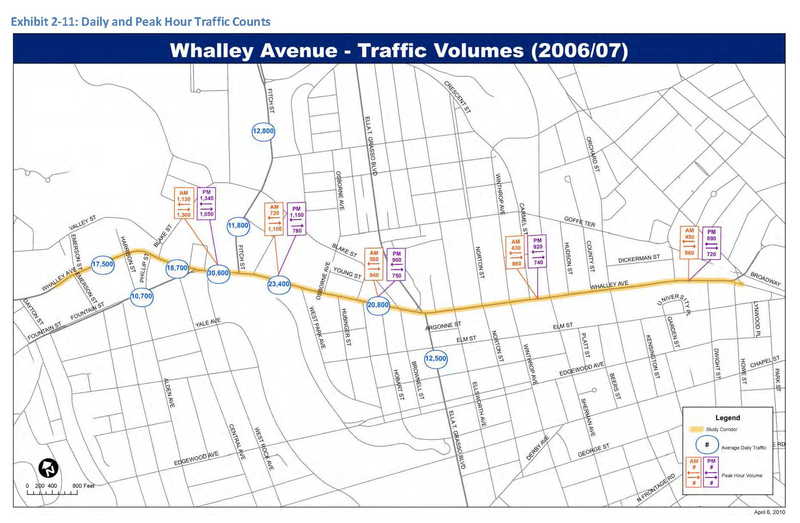 According to data from 2006 and 2007, Whalley’s peak Average Daily Traffic (ADT) is just over 30,000 cars near the intersection of Fitch Street. Much of the corridor, however, experiences an ADT of 15,000 to 20,000 – quite a bit more than Whalley’s design ADT of 32,000 vehicles per day. Reducing Whalley Avenue to one travel lanes in each direction with a central turning lane would still accommodate 22,000 vehicles per day while providing space for shared bus and bike lanes in each direction. Whalley Avenue, as currently designed, provides too much space for cars, while ignoring other road uses like pedestrians, cyclists, and bus riders. An opportunity exists to radically remake the thoroughfare in a way that increases safety and ridership of alternative transportation modes, decreases illegal sidewalk bicycle riding, and presents New Haven’s prioritization of multimodal travel to a wide audience. A project like this, in light of Governor Malloy’s implementation of GPS tracking for CT Transit buses, could usher in a new era of safe, convenient, and sustainable transportation for thousands of Greater New Haven residents. Click here to view SCRCOG’s 2010 Whalley Avenue Corridor Study, which proposed adding central planted medians to this thoroughfare. Awesome vision. A detail on Whalley at Mitchell Library / BEKI (Harrison to Philip and Blake): That part of Whalley is especially difficult because of the incline and curve. Maybe consider using space on the super-wide existing sidewalk in front of BEKI (white brick synagogue at Whalley and Harrison) or big lawn at Mitchell Library for safer segregated bike lanes. Car on that curve regularly jump the track, and even more often encroach on the shoulders. Thank you for your feedback. I agree that the portion of Whalley Avenue that narrows down in the Westville Village poses a problem for incorporating dedicating cycling infrastructure. However, while the roadway does curve sharply uphill near the synagogue, the on-street parking also drops away, which creates additional space for wide bike lanes (perhaps even separated from traffic by delineator tubes). Another option might be to somehow use the sidewalk in that area as opposed to the roadway itself, as you suggest, but in all likelihood, Whalley Avenue in the center of Westville, especially where there is on-street parking, is just too narrow for bike lanes, in which case the cycling infrastructure can be split between Whalley and Fountain Street at Emerson Street and reconverge at the intersections of West Rock Avenue. There are many ways to include improved transit and cycling infrastructure along the Whalley Avenue corridor – this article was an attempt to layout a couple possible scenarios that might get the ball rolling. Thanks again for your comments.